No matter how impressive the world’s natural wonders are, they always seem to be hijacked by massive hotel chains and international companies. Often forgotten are the locals that owned the lands before they were deemed National Parks and tourists from around the world started swarming them. So often, those locals are left to the trails begging visitors to buy their souvenirs and postcards. 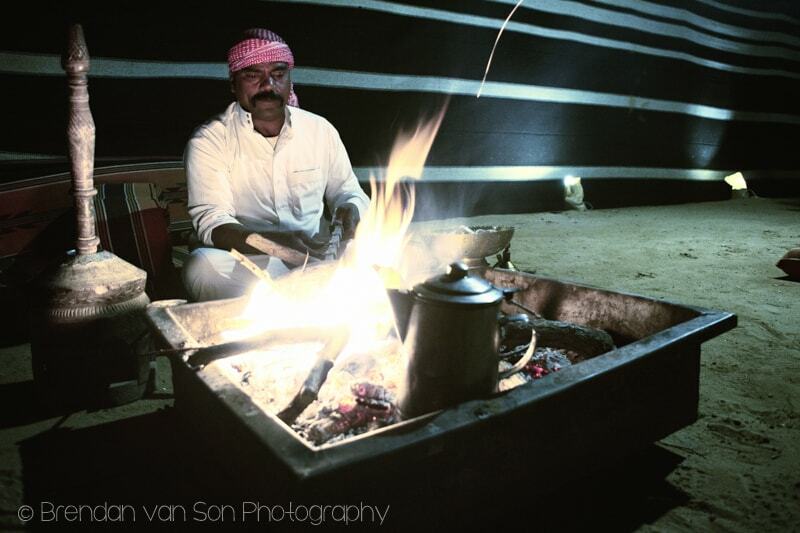 But in Wadi Rum, its the Bedouins that still rule the trade. Part of their advantage, is their ability to allow tourists in on their easy-going way of life, even if that may only be for one night. 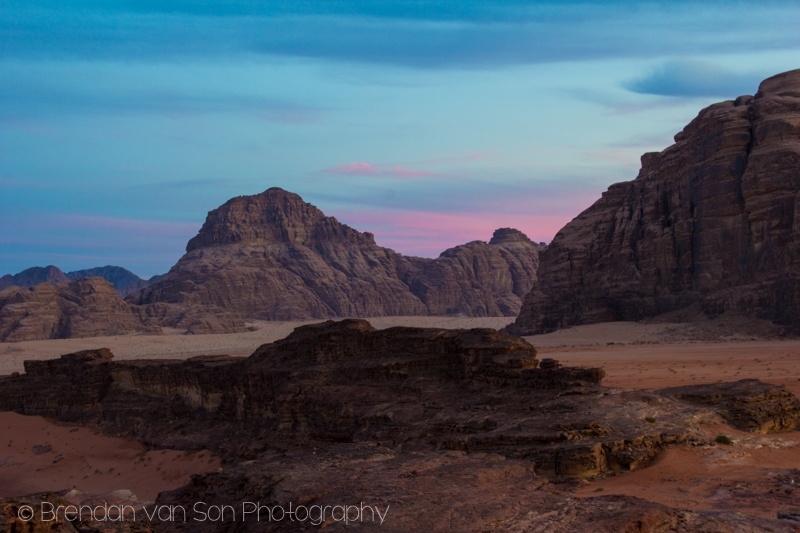 We raced into Wadi Rum and were immediately saddled onto a pair of gargling camels in an attempt to catch the sunset over the moonscape world around us. The sky slowly turned from a soft blue, to a dusty grey, then a heavy dusk, and finally a star-filled abyss of black. With a blank of stars overhead, we retreated into the tents of a Bendouin camp called the Captain’s Camp. And well the buffet-style dinner may have not been the most traditional, the décor, atmosphere, and the songs being sung and strummed certainly were. In the early evening, a wide-ginning man, short in stature sat stirring at a pan outstretched on the fire. The aroma of coffee beans was set a . waft across the camp, along with a healthy dose of herbs. As the beans bake, a trickle of people make their way to the fire; a natural magnet for men in robes in the heart of the dark. The coffee-maker draws the beans from the pan and spills them into a deep dish. Like an African woman pounding her cassava paste, he drums rhythmically at the seeds with a staff of wood. The edges of his stick are ribbed and with each pull he adds another sound to his beat. Dadadada pow, dadadada pow. Soon, the whole campfire gang erupts in rhythmic claps. A man in a colourful robe and a headscarf of red and white starts singing to the beats, a couple others chime in. It’s electric in the way only improvisational music can be. 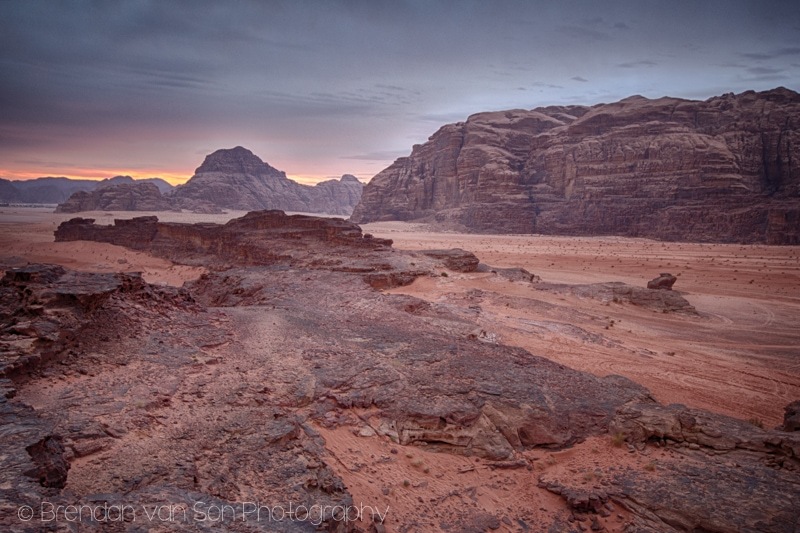 In the morning, I rise well before dawn and lace my running shoes to hike out into the empty dunes and sandstone ruins of Wadi Rum. The morning sky is purple, then orange, and finally a hazy blue. Off in the distance, the rocks tower from the sand creating a jagged view. It’s hard not to feel emotional at dawn. You’re eased by the morning, yet tired from waking so early. The world around you seems so mystical and rich. But it’s the freshness of the morning I love. It’s the absence of people, traffic, and white noise. It’s the richness of the world, and how it makes you feel like you have it all to yourself, at least for a moment. Though many might wonder why anyone would stay out here when the wealth of cities is so alluring, every morning that I rise to watch the sunset, I understand. Peace. Following breakfast, we hop in the back of a pick-up truck. 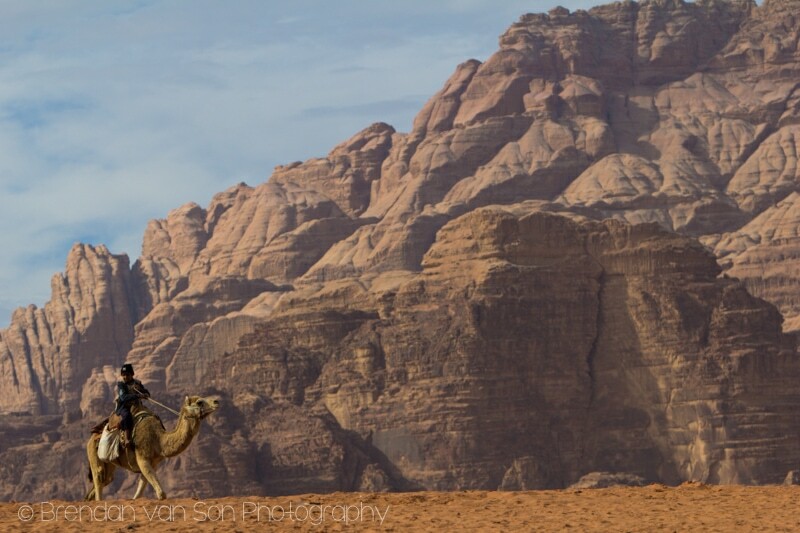 A Bedouin driver spins us along the dirt tracks, over the soft sand dunes and into the heart of Wadi Rum. A group of boys leads a train of camels in the distance, they’re back-dropped by the tooth-like features of this brilliant landscape. 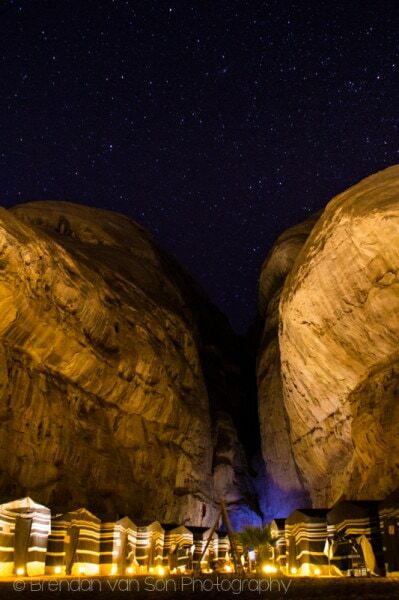 It’s an utterly out of this world scene, as they all seem to be in Jordan. But at the end of the day, it’s not the landscapes, the ancient cities, or the luxurious destinations of Jordan that make it so appealing: it’s the people. I’ve learned in travel that it’s the people, first and foremost that make a destination. I witnessed places in Morrocco completely destroyed by people. But in Jordan, from the Bedouin in Wadi Rum to the locals in Aqaba, everyone has greeted us with such welcoming hands. 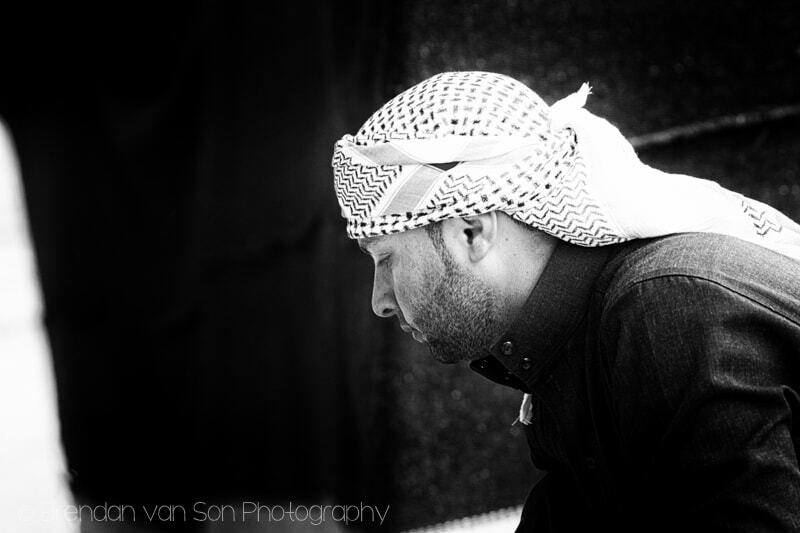 It’s the people of Jordan I’ll miss most, when it’s all said and done. It’s the people that will make us recommend it to other people. It’s the people that will make us visit again and again. And I hope we can. It looks like a landscape from another planet. So amazing! Love the photos. Thanks for checking it out, Jen. 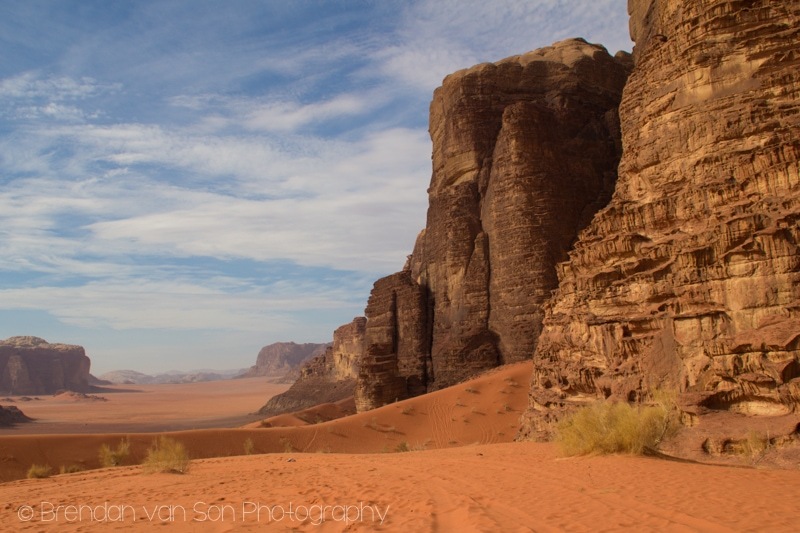 Wadi Rum is really special! That picture of the stars over the camp is just incredible! It sounds like a lovely experience. The place is very beautiful! And yes the photos of the night sky with the stars scattered all over seems surreal. Peace, indeed. The world is a wonderful place to share with everyone. Super photos, nicely told. The stars and the camp at night is brilliant. Wow, amazing pictures and an even better experience. I’ve found myself in some tough spots, hitchhiking and backpacking around the Middle East and also found the Bedouin to be extremely friendly and welcoming. Thanks for sharing, Brendan.